Every year on June 21 Paris celebrates la Fête de la musique (The Festival of Musique), an astonishing city-wide street party. As I’ve explained in prior posts, this is sort of a secular Mardi Gras, with intellectual roots in pagan solstice festivals. It’s also celebrated elsewhere in France and in other countries; there are even a few events in the U.S., but nothing like in Paris. I had invited my Japanese house guest, Kohei, to wander through it with me, but then I noticed a pic on my Facebook feed of a handsome young man posing with the Eiffel Tower in the background. Sawyer is an American living in Sydney who I had encountered through his blog four or five years ago but had never met in person. He was here with his best friend Joshua and his ex-boyfriend Seth, so we got together to stroll across Paris in the afternoon and again to experience the Fête de la musique in the evening. It was wonderful to finally meet Sawyer in person! And an additional pleasure to meet his friends — especially Seth, who shares many of my literary and philosophical interests. 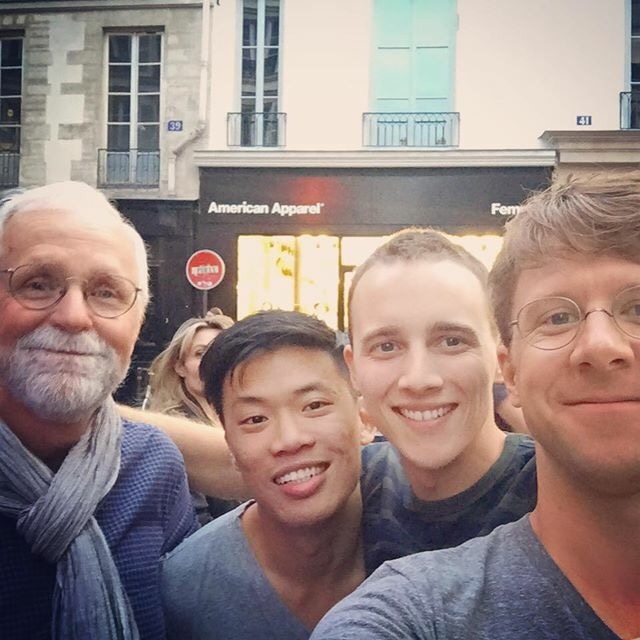 Bob, Joshua, Sawyer and Seth at la Fête de la Musique, Paris, June 21, 2015. Our precise trajectory was complex: Joshua didn’t arrive until late afternoon, and Kohei had slept in, so the afternoon walkers were Sawyer, Seth and me. We met at métro Étienne Marcel, then walked up rue Montorgueil to see my place (where we woke up Kohei), then strolled along the Grands Boulevards to the Place de la République, over to Canal Saint-Martin, down to Place des Vosges, then over to the inevitable Open Café. They then headed back to their hotel in Clichy to meet up with Josh, and I went home to catch up with Kohei. We reconvened in my quarter, bought cheap beers from a supermarket, and strolled over to the Marais. Each member of our group reacted differently to the rising tide of music and the rapidly growing crowd. After we all had a light dinner Kohei went off to meet a new friend while Sawyer and Joshua headed back to their hotel to sleep off their jet lag. Seth and I, however, found the impending chaos thrilling and dove right in. 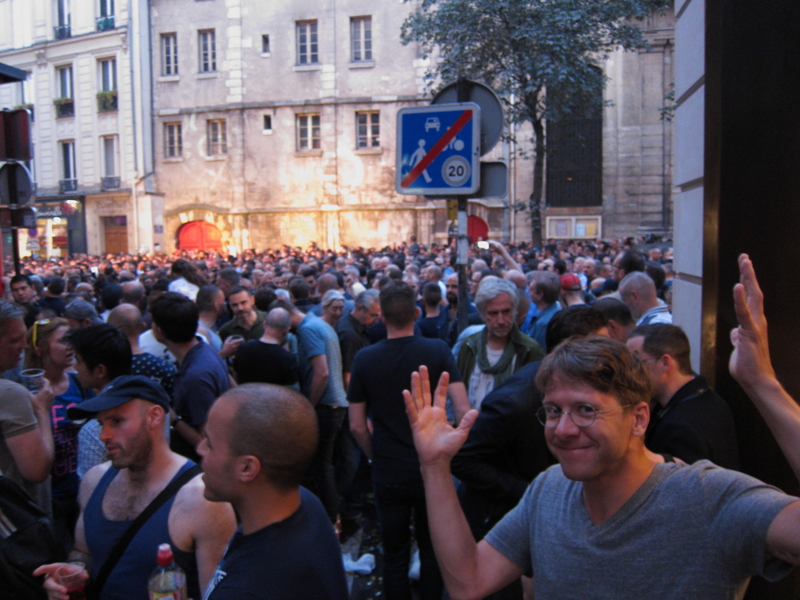 Seth outside Cox bar in the Marais at la Fête de la Musique, Paris, June 21, 2015. 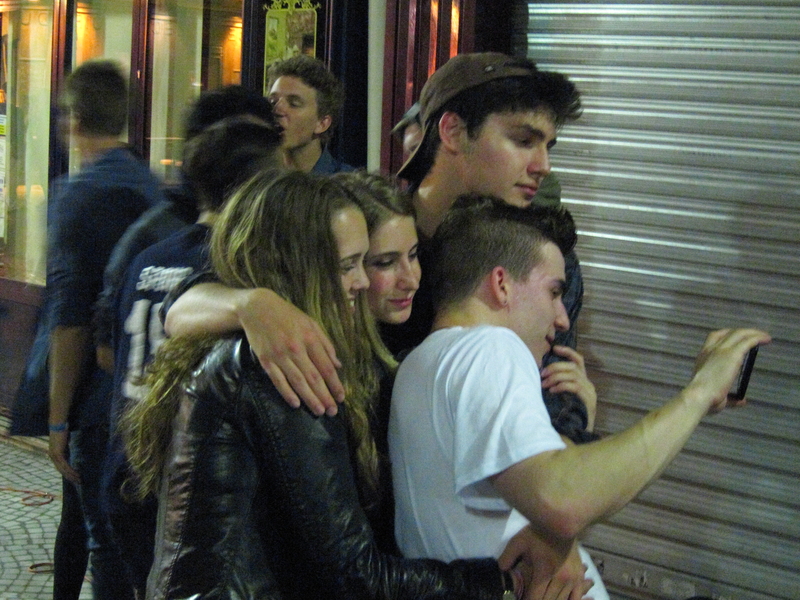 Selfie by friends we haven’t made yet, la Fête de la Musique, Paris, June 21, 2015. 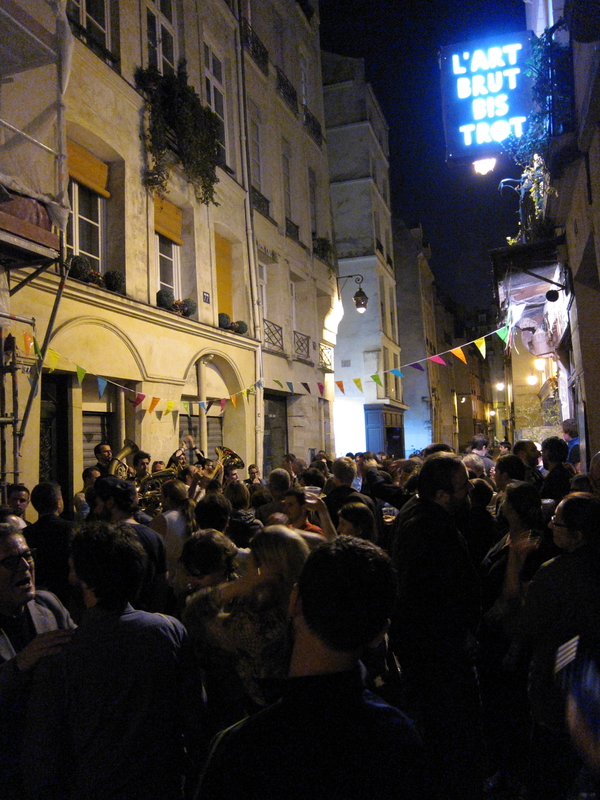 Brass Jazz music on rue Quincampoix, la Fête de la Musique, Paris, June 21, 2015. At the end of the evening I walked Seth to his station (the métro runs all night on la Fête de la Musique), then strolled back home. I first encountered a trance dance party in the shadow of massive Saint-Eustache. I grabbed a panoramic video clip of the scene, starting with a cheerful older woman, then soaring to breathtaking heights. On rue Montorgueil, as I neared home, I stopped to appreciate an attractive group of young people who were playing music and dancing. 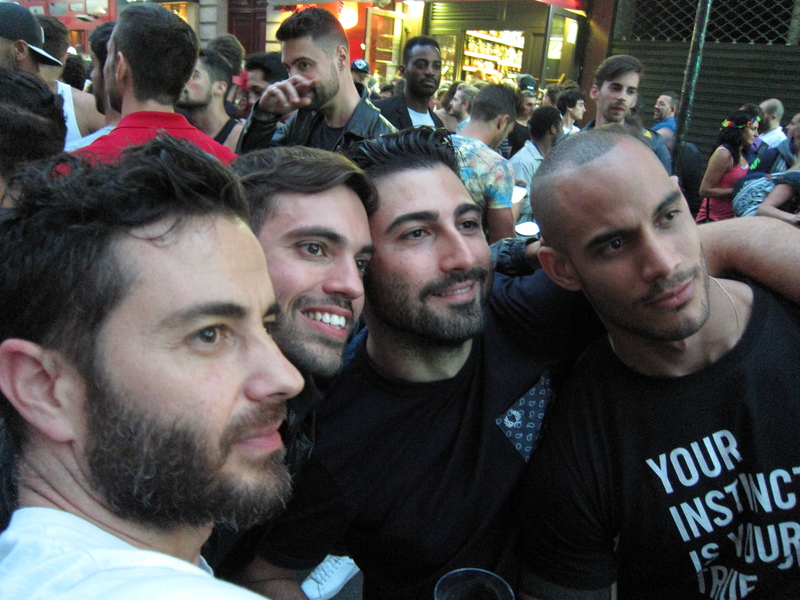 Selfie by more friends we haven’t made yet, on rue Montorgueil, la Fête de la Musique, Paris, June 21, 2015. I had commented to a Boston friend a few days before that my Paris visit this year had been nice but had lacked an over-the-top awesome experience. I take it back. Mot du jour: « vraiment pas mal », “Quite good.” To a jaded Parisian nothing is ever good (bon) or very good (très bon). If something is quite ok you might say that it’s not bad (pas mal) and if it’s really excellent you can say it’s truly not bad (vraiment pas mal). My last week started on a muted note, with Gerry’s departure for Antwerp. We took our last walk around the quartier and enjoyed our last lunch, at historic Au Rocher de Cancale. Even though I have another week here I felt a distinct sense of “second-hand nostalgia” — seeing Paris and especially rue Montorgueil for the last time (this year, anyway) through his eyes. In just a few days this will be my own personal experience. After Gerry left I strolled over to the garden of the Palais Royal to read a bit more of Les Particules élémentaires by Michel Houellebecq, which I had scarcely looked at since my first week. The fall flowers are lovely, but inevitably pale in comparison to the spring flowers that thrilled me my first year. 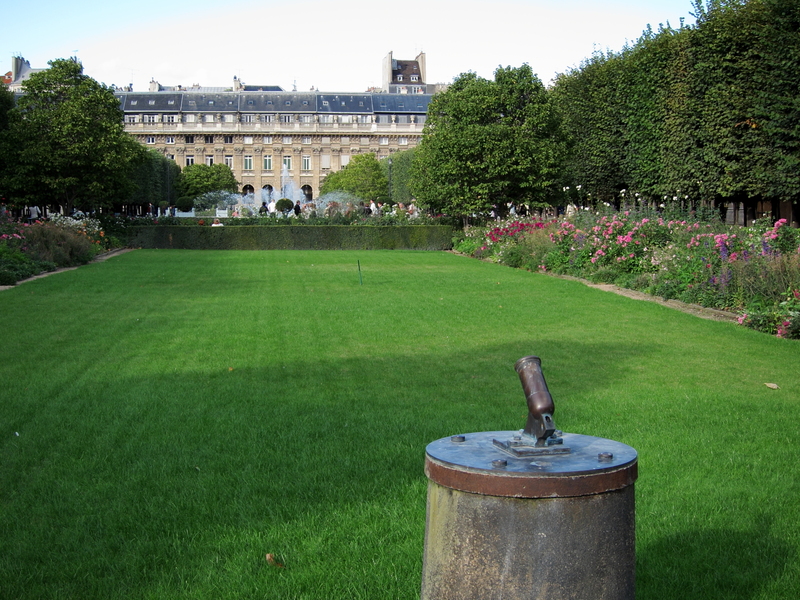 This year I noticed for the first time “The Little Cannon of the Palais Royal.” It was placed there in 1786, and fired at noon on sunny days until 1914; since 1990 it’s shot off every day. Is public safety perhaps the reason why the pelouse in front of it is interdite? My walk home included a pedestrian walkway through the gigantic work-site for the Les Halles project. 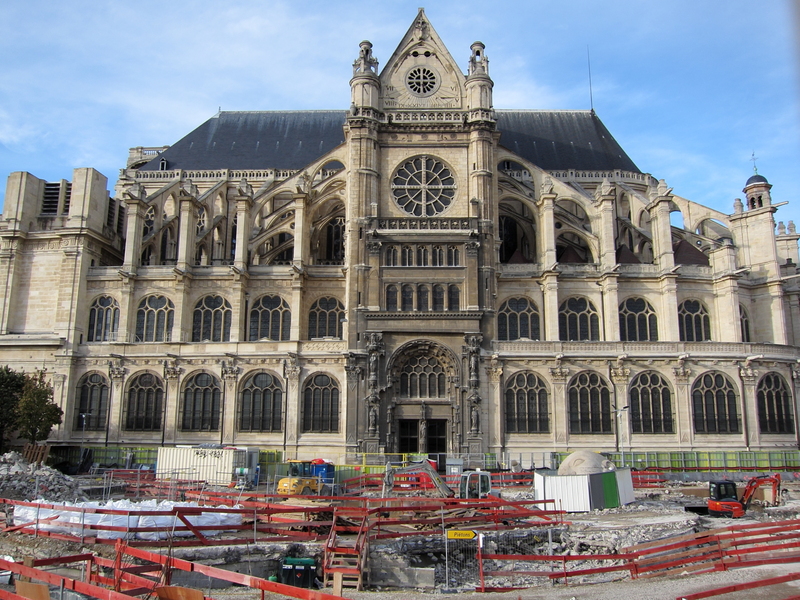 This affords an impressive view of Saint Eustache, including, if you look closely, a huge sculpture of a head that is one of the few elements of the prior configuration that is destined to survive. 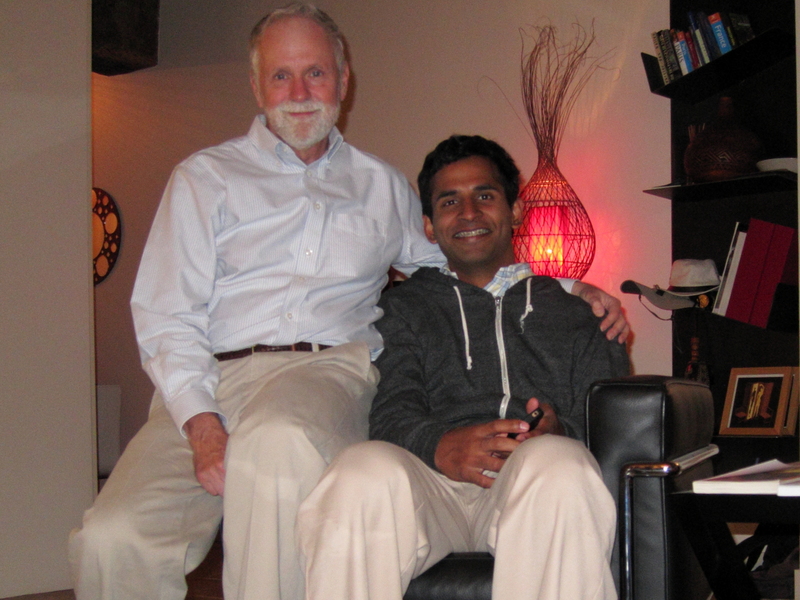 I had made no special plans for dinner until Channa, a med student friend from Boston, messaged me to say he was in town for a few days and would like to get together. The plan was jeopardized by a bout of food poisoning, caused by his eating a canary (where or why I never ascertained!) but happily he had recovered by evening. I picked him up at his hotel at Châtelet, because he was still getting his bearings, and we strolled back to my place for an apéro. We had kir and dinner at Lézard Café. The food was good, although it arrives so quickly that you wonder whether it’s mostly prepared in advance and just heated for each diner. The waiters were charming and efficient, as usual. A young Indian waiter turned out to know five languages, and engaged in a lively conversation with Channa in Sinhalese. After re-grouping back at my place, and plugging in Channa’s iPhone for a much-needed charge, we went for a refreshing swim to finish off our evening together.